Perfect for everyday wear! Our knit headbands come in a wide variety of colors and are super comfy! Don't waste money on low quality headbands! Pretty headband with soft material and beautiful design is the best choice for your lovely baby. Simple enough,but let your kids pretty enough. Each of our baby headbands are created with QUALITY in mind - The hairbands are made with super soft, light and stretchy nylon fabric , using non toxic glues & sewing wherever possible to reduce the use of chemicals in our products and keeps your bows from falling off, which make them the softest & safest choice for your baby's delicate head. We spend that little bit extra in the design, craftsmanship, materials and testing so that we're a brand with a conscience. We also stand behind our high quality products with a satisfaction guarantee . If for any reason you are not completely satisfied with our products, simply just let us know and we will refund your money with no questions asked. All moms want the best for their child and the owner, being a mom of two little ones - totally gets it! Product Details: - Each set includes 10 pack of elegant baby girl headbands shown in the first photo with cute display card ready to be given as a gift! - With 10 different styles, colors, and patterns to choose from, your princess will have a bow to match every season outfit. - Each baby bow is hand-sewn, pressed, folded, tied, and then attached to our super comfy nylon headbands! The nylon headbands are one-size-fits-all and grow with your baby - no more buying new headbands as they grow! - Suitable for babies with or without hair, our head wraps contain no wires that could potentially hurt your baby's head. They are very soft and stretchy and will not leave marks on your baby's head. This set of 10 baby bows includes: 1 Lace Bow. 1 Pink Velvet Knot Bow. 1 Butterfly Denim Bow. 1 Classic Black Striped Sailor Bow. 1 Mini Flower Bow. 1 Dainty Suede Bow. 1 Floral Patterned Bow. 1 Pink Leather Bow. 1 Gray Bow. 1 Solid Pink Bow. Description The hair Clips are made of durable soft satin ribbon and hard metal materials, and can be clipped in your hair with the featured alligator clip backing. Features - Most alligator clip ends will be lined with ribbon to blend with the design of the hair accessory. - The hair clips can be used to decorate headbands, hats, bags and shoes, and also be used as a hair clip for girls of all ages! 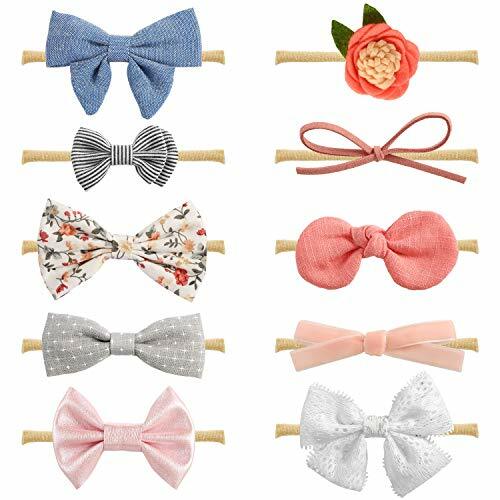 Set of 40PCS ( 20Pairs); Hair bows size: 3 inches;Made from grosgrain ribbon; Attached with 4.5cm alligator clips.100% Handmade Hair Bow Clips for baby girls. 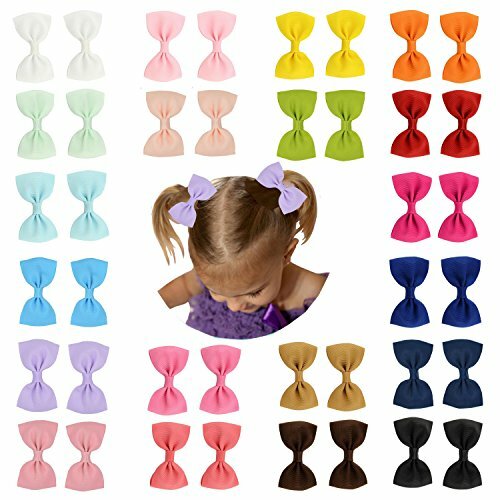 VARIETY OF COLORS-20 Colors available to match your baby girls's outfits for almost all occasions.These boutique handmade hair bow clips will make your little girls'every day dressing more charming. HIGH QUALITY RIBBON MATERIAL: The Ribbon Material we use are all new ones with GOOD QUALITY. The bows are glued well with our skilled and professional workers under strict quality control. JUST THE RIGHT SIZE: The hair bow is 3 Inches attached With 4.5 cm alligator clip with teeth. They can hold fine hair well without falling out.It's a good choice for pigtail or simply set on the side of the head. PERFECT FOR A GIFT SET- A perfect gift choice for any occasion like Birthdays, Party, Baby Gifts, Christmas and etc.The Hair Bows are Perfect For Newborns,Toddlers,Baby Girls,Little Girls, Big Girls,Women Etc. VARIETY OF STYLES - different styles, colors and patterns included to match any outfit and occasion. 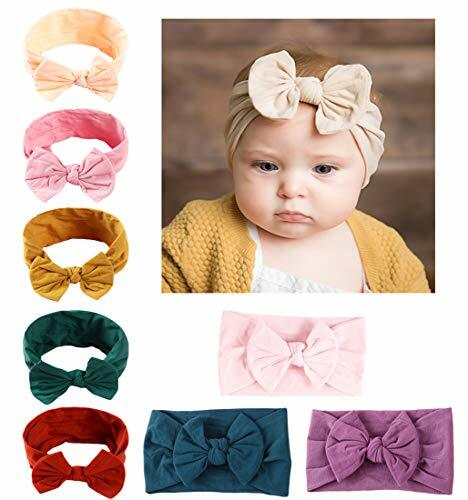 SO SOFT AND COMFORTABLE Material- the headband is made of high-quality nylon, it is soft and gentle on the baby 's head, the stretchy nylon bands can be hand stretched to fit the head of an infant all the way up to toddler girls. Babies don't even feel that the head band is there! ONE SIZE FIT ALL: the headbands is adjustable to grow with your baby,it allows a baby headband to expand to fit your growing baby! This headband will fit all ages!The headbands are initially about 12 inches in circumference, small and soft enough so that they won't slip off your baby's head and no marks leave on your little newborn's head. DECENT PACKAGE For BABY GIFT SET - Those Cute Little Headbands are packaged in a nice decent gift box. These lovely baby bows are simple but cute. They will be perfect for baby shower gift or birthday gift! IDEAL FOR NEWBORN PHOTOGRAPHY - Those trendy and unique baby bows are perfect hair accessories for your newborn photos. with 10 different design adorable headbands, you are certain to find the perfect headband for matching every outfit. 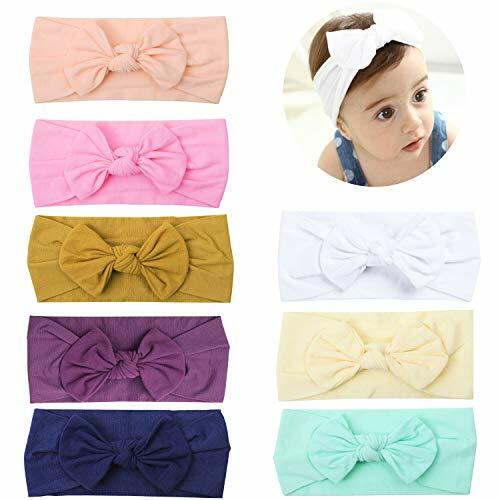 SO SOFT NYLON MATERIAL- the material is made of soft nylon,they are very stretchy.the elastic headband fits most babies from newborn to toddler. ONE SIZE FIT ALL: it allows a baby headband to expand to fit your growing baby! This headband will fit all ages! A VARIETY OF COLORS: It contains multiple colors in one package, you are certain to find the perfect headband for matching every outfit. NO MARK LEAVE- on baby's head, It is so soft and light nylon that your baby don't even realize they are wearing it! Not too big and not too tight! Perfect for Newborn! PERFECT FOR ANY OCCASION-these nylon headbands are perfect gift for any occasion! Birthdays, Baby Shower, Baby Gifts, Christmas, Family photography, holiday! 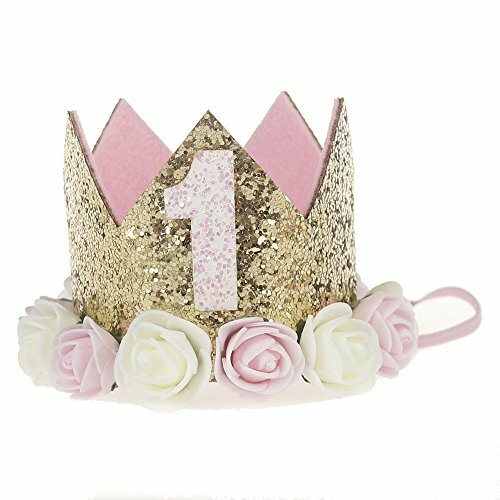 Baby Girl Birthday Crown Flower Tiara Headband. Gold Glitter Crown! Truly fit for royalty, made with gold glitter, pink felt lining and a true touch of elegance. Crown is perfect for birthdays of all ages. Great photo prop piece for birthday party. Suitable for age from 0.5-3 years old kids. Custom made to age of "1/2", "1", "2" or "3" number style. Sizing - 13inches (Age 0-3months) - 14inches (Age 3-6months) - 16inches (Age 6-12months) - 17inches (Age 12months - adult) friendly customer service. You can return our product with no reason within 100 days and will get 100% refund. In rare condition,if you receive damaged product or defective product,please contact us,we will apply a refund or replace with a new product for you. CELEBRATE THE HOLIDAYS IN STYLE: Pink and Gold Glitter with Felt Lining inside and Floral Design on the Outside.Suit for baby birthday party ,take photo or daily life. PREMIUM MATERIAL: 100% Polyester, Made of high quality elastic headband, securely fit child's head. The elastic band can stretch around the back or front of the head, is very soft and comfortable fit,Glitter and Artificial Flower. COMFORT AND EASE:The elastic band can stretch around the back or front of the head, is soft and very comfortable to wear. BIRTHDAY THEME: Every hat with a number on the hat, From 1/2 Old to 3 Year Old, Choose the Corresponding One for Your Baby. , very special precious birthday hat. Unique and exquisite products are specially designed for beautiful girls! babies don't miss it. we will be careful to solve your problem at the soonest time, until you satisfaction. Material: soft nylon, a very elastic organic material . A headband will fit all ages! it allows a baby headband to expand to fit your growing baby! Headband can be a good stretch and they will maintain their new size. 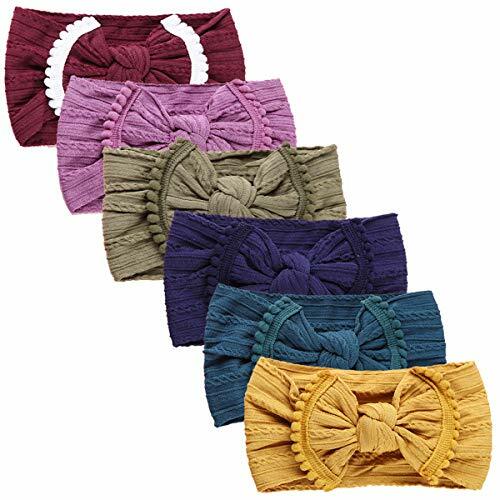 the elastic headband fits all babies ,toddler,little girl,child. 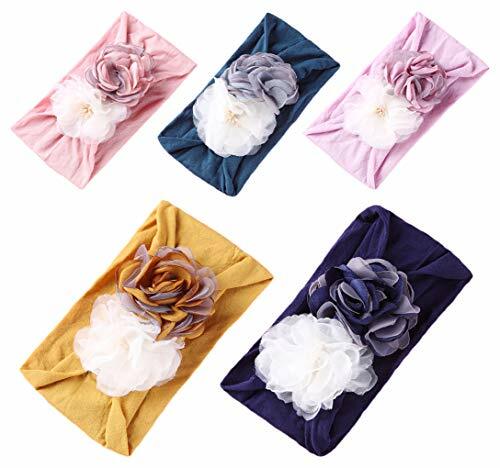 It contains 8 colors in one package,ou can quickly find a different color to match different clothes,cute hair band,Perfect decorative accessories. NO MARK LEAVE- on baby's head, It is very soft and light nylon that your baby don't even realize they are wearing it! Great hair accessories! very suitable for newborns, infant . NOTE:The color of the actual items may slightly vary from the above images due to different computer screen, thanks for your understanding. If you have any questions, please contact me, we will solve your problem at the soonest time.thank you ! Size: 14 - 15.3 head circumference, that every child is different and head circumferences can vary greatly.this headband will fit most newborns, but may be a bit large for some. No mark leave, Our headbands are one-size-fits-all stretchy nylon bands, providing plenty of room to grow through newborn/infant stages through toddler! 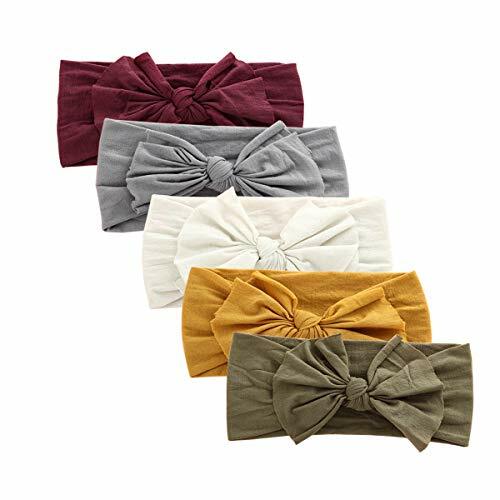 The headbands are initially about 12.3 inches in circumference, small and soft enough so that they won't slip off and won't leave marks on your little newborn's head. 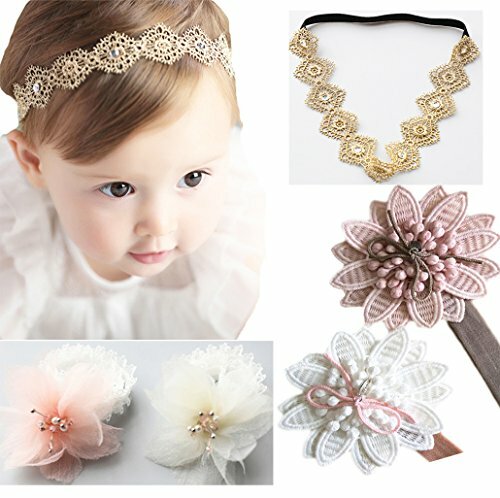 Elegant unique designed Fantastic hair accessories for baby girls,newborn etc. 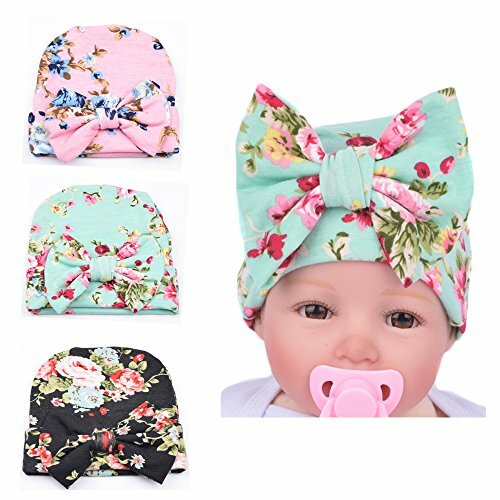 They can fit well for babies,Kids,Children, toddlers, girls even women, they are all 100% handmade flower headbands, A wonderful gift for yourself, friends or family. 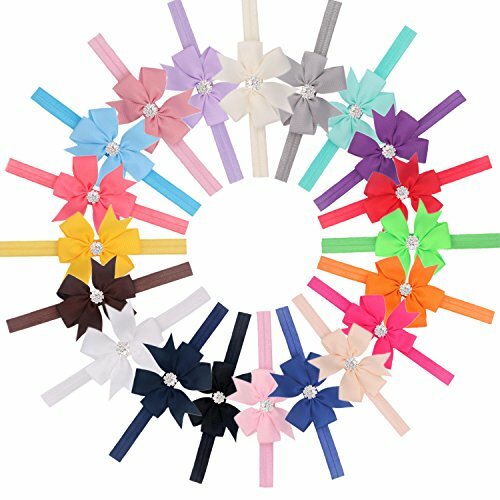 Material: these hair bows are made of high quality Cloth ,Chiffon and ribbon band , these flower hair band are environmental, and harmless to everyone. Color: 12 different colors, they are all very lovely and bright,beautiful. 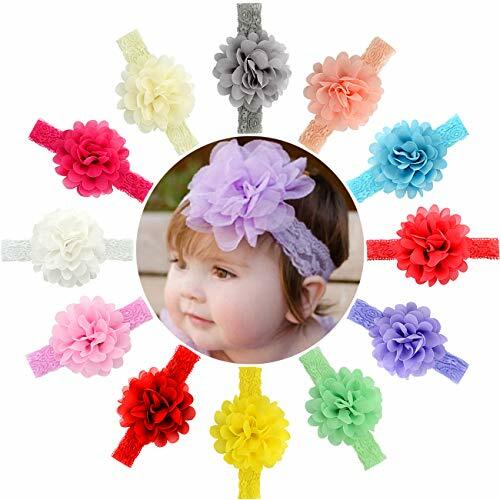 These flower headbands are made from soft material, no harm and no stimulation to baby's skin. The new design would make your baby cute and charming, let your baby appear beautiful and stand out anytime. Beautiful hair accessories, babies don't miss it. Band 12 inches (Girth). A headband will fit all ages! it allows a baby headband to expand to fit your growing baby! Headband can be a good stretch and they will maintain their new size. 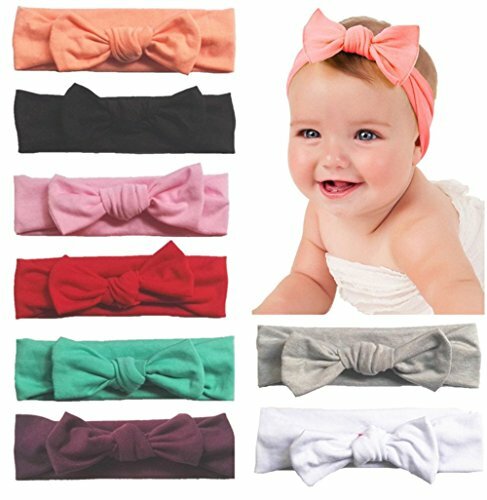 the elastic headband fits all babies ,toddler,little girl,child. It contains 10 colors in one package,ou can quickly find a different color to match different clothes,cute hair band,Perfect decorative accessories.